With Facebook apparently stopping their first party (though OSmeta-based and very bloated) applications for Windows 10 Mobile working after April 2019, some people might be worried that their Facebook 'fix' won't be available on the platform. Happily, anyone with any sense will have uninstalled the first party app long ago anyway - see the options below. This also applies to Facebook's (also bloated) eponymous Messenger and Instagram applications (for the latter, there's Winsta). 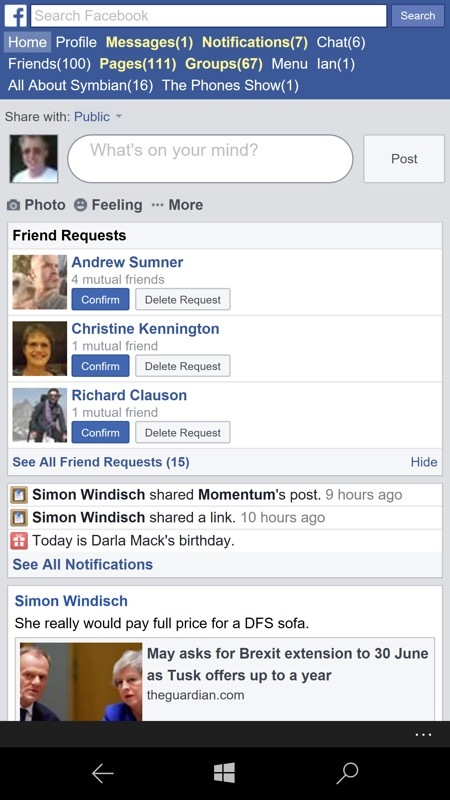 You may think I'm kidding about the bloat of Facebook's first party clients for Windows 10 Mobile, but I'm not. The 'Facebook' app in the Store at the moment is a whopping 168MB and takes about 15 seconds to launch on a Lumia 950. Which is ridiculous for a social network based on status updates loaded online and with few internal graphic or media resources needed internally. So just say no. I've been recommending this for years. If Facebook is indeed pulling these apps, after years of no updates and no optimisations, it's good riddance. Harsh, but true. 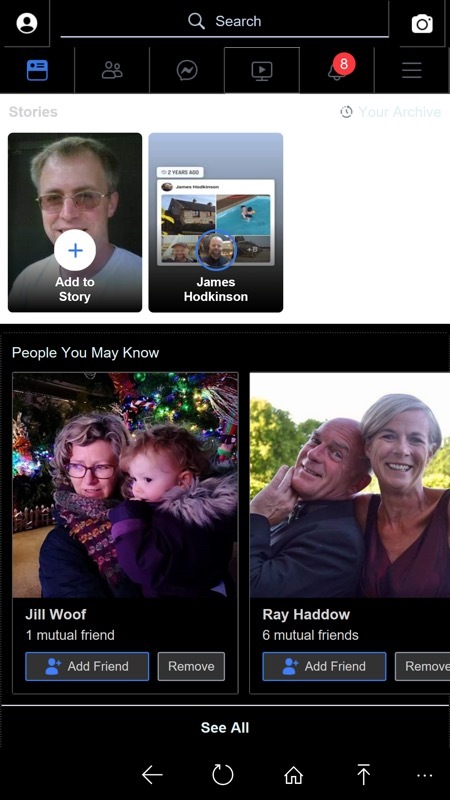 Then there's the huge and growing lobby of tech-savvy people (myself included) who say that Facebook is the privacy-ignoring spawn of the devil - there have been so many issues around personal data being leaked that all sensible advice is to leave Facebook and never darken its doors again. However, Facebook does have its uses. It's still loved by non-techy relatives, typically - we all have a cousin or grandparent who will only use it and it's our lifeline to what they're up to. For this reason, and also because lots of lesser web sites let you 'log in with Facebook', saving you having to make accounts for everything, I'd advise not leaving Facebook altogether. But that also doesn't mean that you have to put up with their client on Windows 10 Mobile being a buggy and resource-hungry mess (it crashes all the time, quite apart from being slow) or with their clients on iOS and Android doing unspeakable things with your data in the background. 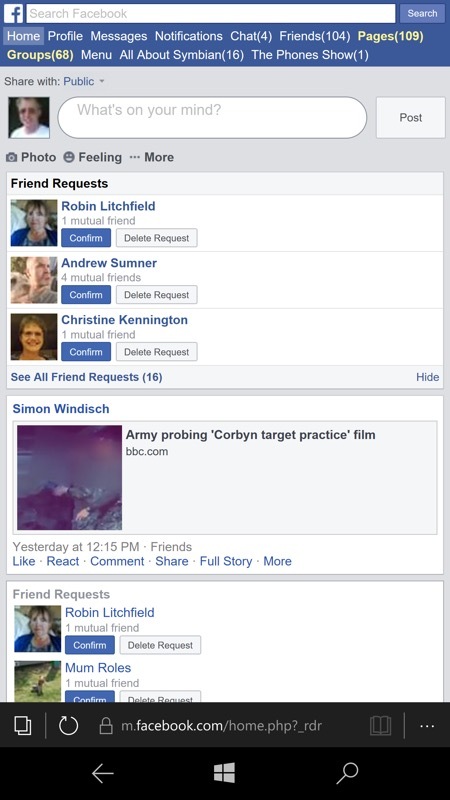 Which leaves the issue of how to access Facebook without really using its own software. Happily, Facebook has to provide a low bandwidth way into its content via the Web and this can be used, either directly, or via a number of 'web-scraping' applications, listed below. Somewhat obvious, but it needs listing anyway. 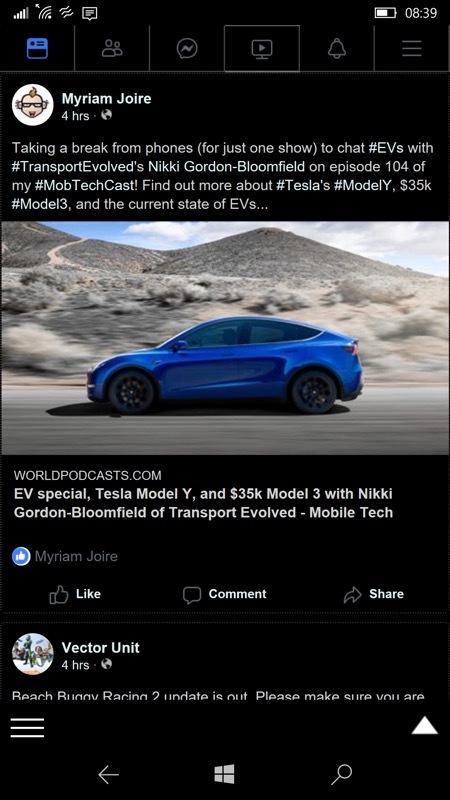 Facebook is basically a web site (with added apps for convenience), so it's easy to access the main content in a web browser, even a mobile one here. In fact, you can get just a bit more screen real estate and convenience by turning the URL into an 'app' yourself with PAWA or just pin it 'as is' on your Start screen. Or just add it as a 'Favourite'. It's up to you. 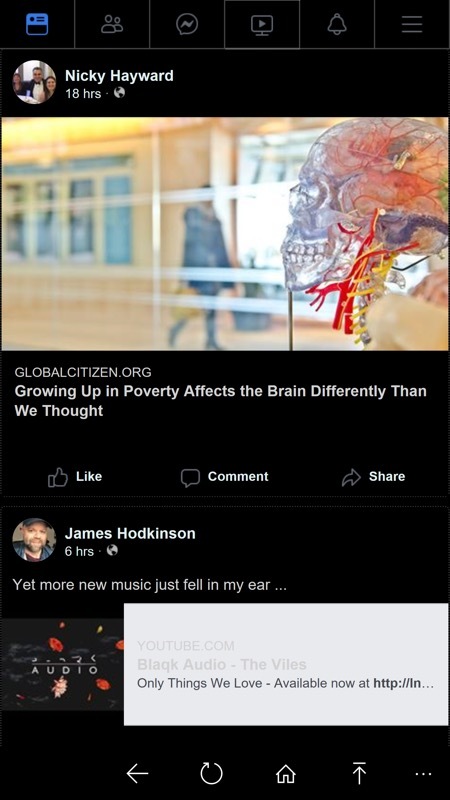 Facebook in Edge and (right) Edge via PAWA - in the latter you get better fonts and more screen real estate. Worth knowing!! The original Facebook-scraper (though see the titles below), this is the best place to start. 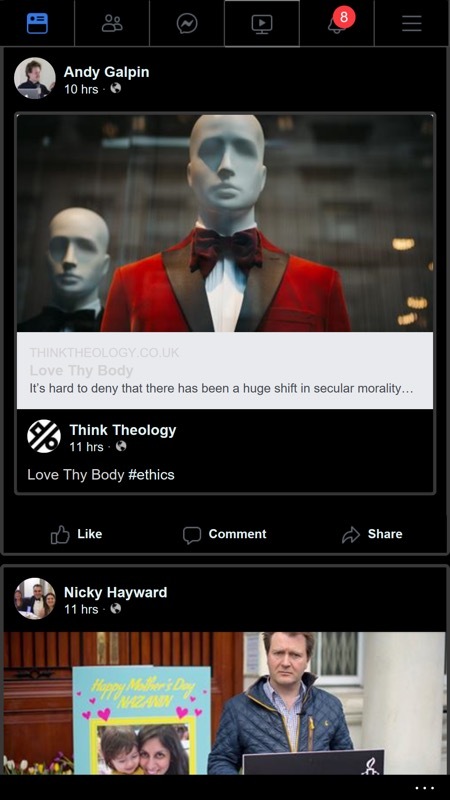 It takes the full Facebook web experience, chops out all the rubbish, turns everything dark (if you want it), and quite a lot more besides. It's Facebook with minimum hassle and bandwidth! Here in black(! 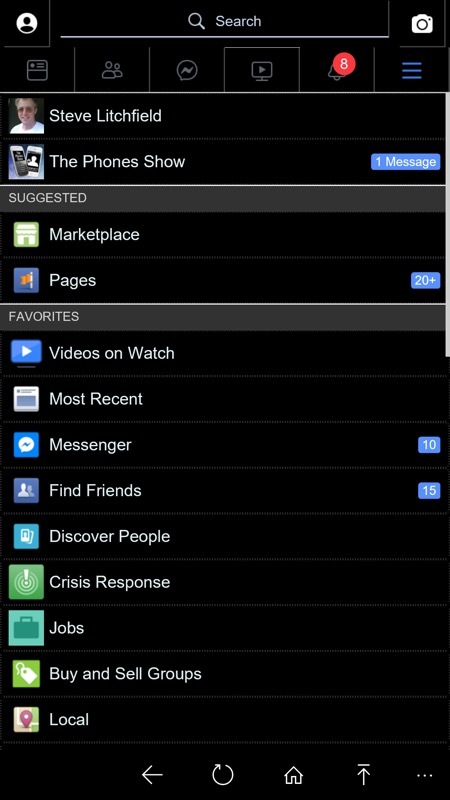 ), see the various Facebook areas and navigation - the main function bar stays frozen and content scrolls under it, though the search field only shows at the very top of the scrolled pane. It's a clever system. Ostensibly a clone of SlimSocial, I'll cut this some slack because, after all, both are based on scraping the exact same web site. So formatting is bound to be similar. I do remember - vaguely - that in the early days of SlimSocial there was some controversy about plagiarising of its code, but hopefully these extra titles are legitimate now. 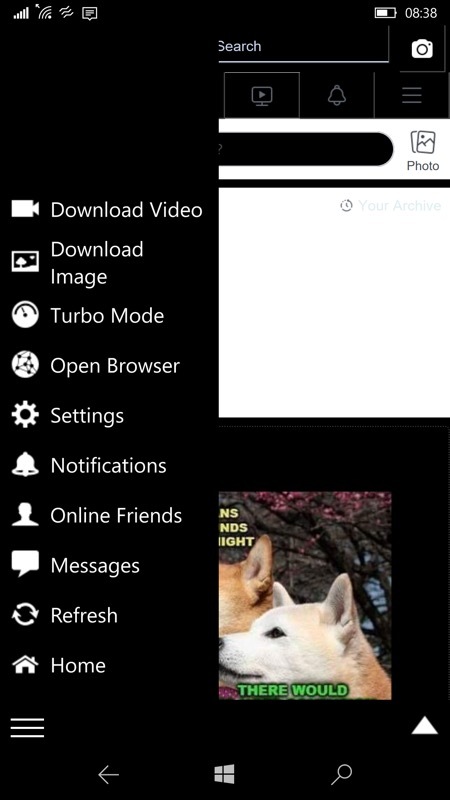 A similar interface again (for the same reasons), but with a few extra twists, including video and image downloaders. 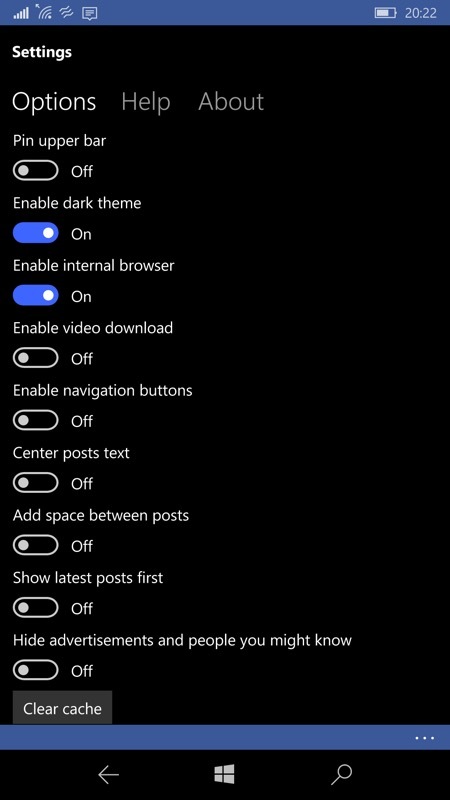 Don't get excited by 'Turbo mode' though, that just switches to the ultra-low bandwidth version of Facebook that you get in Edge. Ditto the 'Windows Hello' support, which doesn't log you in to Facebook, but instead acts as a security system to stop people using this app if they pick up your phone. 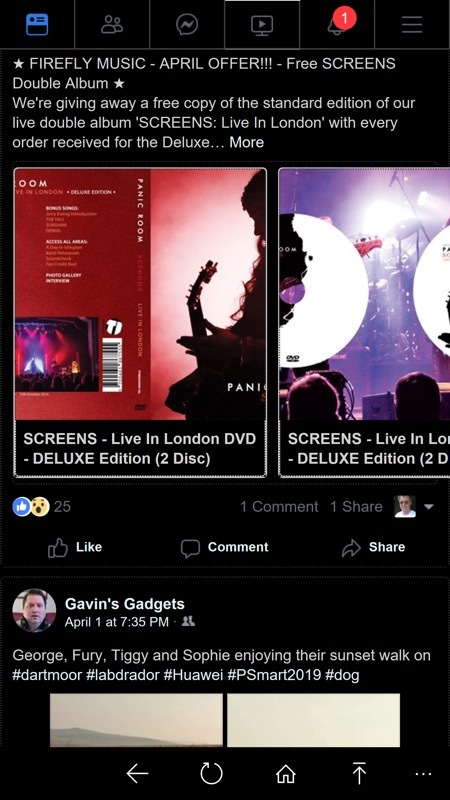 It's slightly odd to have three third party Facebook 'clients' which are so similar, but then again it doesn't matter which one you use as they'll all do the job. If in doubt, grab all three (the last is only a dollar or so) and keep the one you like most. Of course, if you still want the full Facebook experience - so privacy violations, annoying notifications, bonus battery drain, and huge bandwidth swallowing - then you'll need to use the official Facebook app on iOS or Android. I think I'd rather have one of the solutions above though! PS. The source link doesn't make it clear if Facebook is stopping their own Osmeta-built app working after April or if the app is simply being pulled from the store. I suspect the latter and that their official app will actually carry on working past the deadline, at least until some internal API gets changed. But, as you'll have gathered from my vitriol, it matters not a jot since I don't think anyone should be encouraged to use the app in the first place!